This encounter launched me into questioning why many Christians participate in Lent. Ideally, it should be a time of deeper contemplation about God and more focused prayer. Most say that this is what they plan on doing, but for many, life and old habits make it hard for them to execute and they merely pull off the external. As a result, I think many focus on the giving up of a thing as some sort of offering of their devotion, hoping that the mere act of doing so will draw them closer to God. I’m not practicing Lent this time around as I just finished a fast from three things that have been a part of my life every day (mostly) for the last three years. As a result, Lent this year seemed anti-climactic to me, so I’m skipping it. Despite passing on the tradition this year, I found myself unsettled by the typical practice of Lent, sparked by that person’s comments. The thought that Christians are offering up sin as a spiritual sacrifice, bothered me. It seems a bit sacrilegious to me that we offer up for Lent what is essentially all of our failed New Year’s Eve resolutions. Still, sin hasn’t yet entered the picture. More distressing, I noticed a tendency among some to commit to fast from things they were inwardly convicted of. Granted, the things we pick to give up for Lent are usually not blatant sins like pride, vanity, envy or the like. We usually zero in on those ‘gray’ areas that have been bothering our consciences. Things that are otherwise benign activities that we have managed to corrupt with our motives or practice. We pick stuff we want to wean ourselves away from because we can’t in good conscience continue in it, thus it is not done in faith. In essence, it is sin to us. Not everyone I know picks something they are convicted about. Many just pick something that would be hard because they love it and yet, are not enslaved to it. Only the individual can honestly assess that. Is it wrong to pick a sin as the object of what we abstain from in the name of fasting? I’ll let you pray about that and come to your own conclusions concerning yourself. There is nothing in the Scriptures that would point one way or another that I know of, so this is left to your conscience. Yet, I need to remind myself, that the point of Lent (or fasting in general) is not self-improvement. Observe Lent with prayer and fasting but choose what you fast from wisely. If you use the season to jump-start your obedience, nothing lost; you’ll probably benefit more than someone who picked something meaningless to abstain from. Just be careful how you posture yourself during the fast. It is not a sacrifice, nor some holy denial, it is something you needed to do anyways. I think you’ve hit on something. I am still pondering it all in my mind, for I do think that sin ought to be given up because it does separate us from God. But not as a “sacrifice”. To sacrifice is to give something GOOD for someone better. Weren’t the sacrifices that God asked of the Israelites in the Old Testament the best things they had? He required the unblemished and spotless. Always. I feel like I’m doing God a favor to merely give up the bad things in my life. As though me dumping my dirtiness into His hand as a gift should please Him. But, shouldn’t I lay aside sin because I know it is unpleasing to Him. And then, on top of that, shouldn’t I offer my unblemished sacrifice? The first time in my early mornings? My days, my hours, my minutes? The best of my talents? The truest part of my love? My loyalty? The GOOD things that I would rather hoard to myself but give to Him because He is worth more than all that? This may be too vivid an example, but a Christian thinking he is doing something amazing to give up a sin for a time is like a husband coming home to his wife and saying, “For our anniversary this year I will stop cheating on you for a whole week!” That’s not a gift! That is the base requirement that should be lived by daily! A gift is something that costs him something to illustrate his love for her. And so it should be with God. Our giving up sin is the first step…but to lavish our worship on Him would require giving up something good that we would rather keep for ourselves. Thank you for letting me mull over this topic in writing here. It is definitely thought-provoking. I have only just met you a few words ago, but I already love your heart! Lisa, I am so glad to meet you! I think you too, have hit upon something. My first inclination was to say that living a pure life is not a sacrifice, it is what is due. I fret sometimes over my tendency to consider the disciplines of Christianity such as fasting, as some sort of offering. Prayer, fasting, and denying self are not some sort of act of devotion as much as they are a lifeblood of sorts to the Christian experience. As I write this though, the verse from Romans 12:1 came to mind, “Therefore, I urge you, brothers, in view of God’s mercy, to offer your bodies as living sacrifices, holy and pleasing to God–this is your spiritual act of worship.” The verses continue with the idea of transforming our minds and ceasing from the patterns of the world. It seems the only acceptable sacrifice is a holy and pure life….now you have me thinking along different lines and I must grab my Bible and explore. Thank you! I very much liked the insight of how we confuse our outward behavior with what God wants and expects (think the inside and outside of the cup, Matthew 26:23). In that light Lisa’s comments also strike a chord. 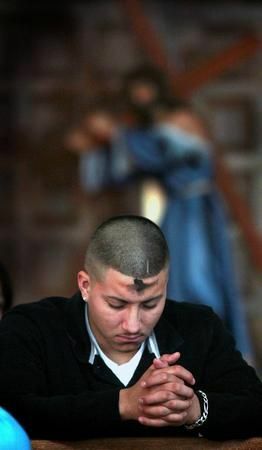 As a non-Catholic the idea of Lent was not something I gave much thought to – either pre or post conversion. It seems to me however it is most often an opportunity for sin (Matthew 5 from the sermon on the mount regarding oaths v33-37″). In that sense, the conclusion… “it is something you needed to do anyways” tends to undermine (what I perceive as) the common idea of Lent in that it begins and ends.